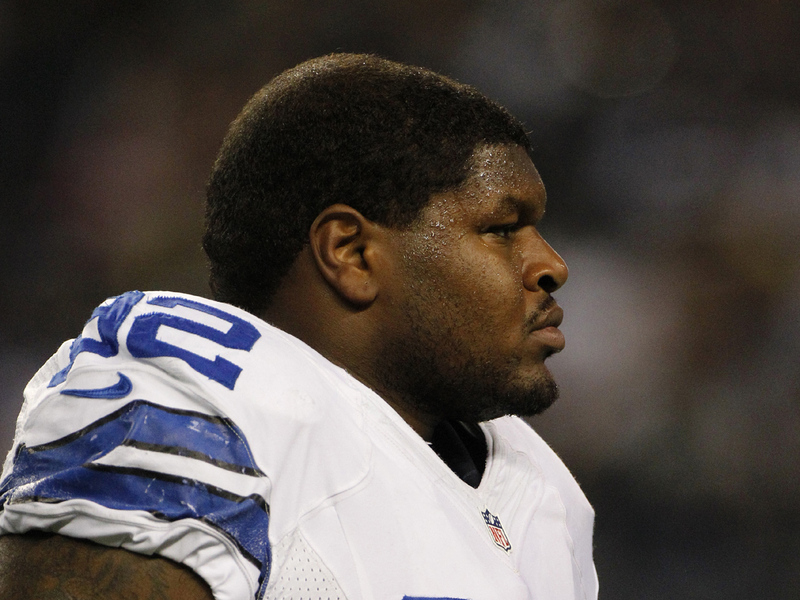 IRVING, Texas Dallas Cowboys nose tackle Josh Brent has been arrested and charged with intoxication manslaughter stemming from a late night crash that resulted in the death of a teammate. CBS Station KTVT reports that Jerry Brown Jr., a 25-year old currently on the Cowboys' practice roster, was killed in the accident. Irving police spokesman John Argumaniz said the accident happened about 2:20 a.m. Saturday in the Dallas suburb, hours before Brent was to be on a team flight to Cincinnati for the Cowboys' game Sunday against the Bengals. When police arrived, Brent was responsive and able to speak with officers. Brown was unresponsive and was transported to a local hospital, where he was later pronounced dead. Officers conducted a field sobriety test on Brent and arrested him on suspicion of driving while intoxicated, Argumaniz said. The charge, a second-degree felony punishable by two to 20 years in prison, was upgraded after Brown was pronounced dead. Argumaniz said Brent, who pleaded guilty to a drunken driving charge three years ago at Illinois, was being held without bond. Brent is named as Joshua Price-Brent in the police news release. Argumaniz also said Brent missed a 10 a.m. Saturday booking session with a judge because he was intoxicated. He did not know if Brent had an attorney. Brent was speeding when the vehicle hit a curb and flipped at least once, Argumaniz said. Police received 911 calls from motorists who saw the upside-down vehicle but they did not immediately have any eyewitnesses to the wreck, the police spokesman said. Argumaniz said when officers arrived at the scene on a state highway service road, Brent was dragging Brown from the vehicle, a Mercedes, which was on fire. Officers quickly put out the small blaze, he said. Argumaniz wasn't sure if the vehicle was a car or SUV and said it wasn't known how fast the vehicle was traveling. The road has a 45 mph limit. "I can say investigators are certain they were traveling well above the posted speed limit," Argumaniz said. Before he was taken to the jail, Brent went to a hospital for a blood draw for alcohol testing and also received treatment for some minor scrapes. Argumaniz said Brent identified himself to officers as a Cowboys player. Cowboys owner Jerry Jones issued at statement to the media saying: "We are deeply saddened by the news of this accident and the passing of Jerry Brown. At this time, our hearts and prayers and deepest sympathies are with the members of Jerry's family and all of those who knew him and loved him." Brent has appeared in 12 games this season and recorded 22 tackles and 1.5 sacks. CBSSports.com reported that, while at Illinois, Brent had been suspended from the team after his arrest in February 2009 in Urbana for driving under the influence. In June 2009, Brent pleaded guilty to DUI and was sentenced to 60 days in jail, two years of probation, 200 hours of community service and a fine of about $2,000. As part of his plea deal, prosecutors dropped one count of aggravated DUI/no valid driver's license. Brent successfully completed his probation in July 2011, court records show. Brent, a nose guard, has played in all 12 games this season and has been a bigger presence on defense with starter Jay Ratliff battling injuries. Brent made his first career start in the season opener against the New York Giants and has 35 tackles and 1 1/2 sacks. The Cowboys signed Brown to their practice squad Oct. 24, but he hasn't been on the active roster. He was released from the Indianapolis Colts' practice squad Oct. 20. Brown played in one game for the Colts, a loss to the New York Jets on Oct. 14. "On behalf of the entire Colts family, our sincerest condolences go out to Jerry's family and friends," Colts general manager Ryan Grigson said in a statement. "He was a good teammate that was well liked by all. Today's tragic news is just another reminder of how fragile life is and how everyday given is a gift." Brown played for San Antonio in the Arena Football League this year. In 2011, he played for Jacksonville in the AFL and the Hamilton Tiger-Cats in the Canadian Football League. He was born and grew up in St. Louis, attending Vashon High School.